The Battle of the Plains of Abraham was the pivotal battle between the French and British during the French and Indian War. On September 13, 1759, General James Wolfe led a British invasion force against the French forces at Québec led by the Marquis de Montcalm. Although General Wolfe would die in the battle, his forces would defeat the French and change the history of Canada forever. The Marquis de Montcalm would be mortally wounded that day and he would die later that night completely unaware that General Wolfe had also died that day. Among the soldiers serving General Wolfe and participating in the battle was Matt Damon's 5th great-grandfather Solomon Fay. Solomon would survive the battle and two years later would marry Mary Pratt, the 5th great-grandmother of Matt Damon. Matt Damon is a direct descendant of Mayflower passenger Richard Warren. Among some of Matt's closest famous kin are a few patriots from the American Revolution, including Samuel Prescott the rider who actually completed Paul Revere's famous ride, Nathan Hale the American spy who was executed by the British, and war hero Ethan Allen, who along with Benedict Arnold, captured Fort Ticonderoga. He also has connections to poets Ralph Waldo Emerson and Henry Wadsworth Longfellow, and the legendary buffalo hunter, pony express rider, and showman Buffalo Bill. 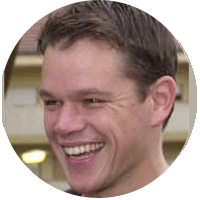 Matt Damon has a number of U.S. Presidential connections including, but not limited to, William Taft, Grover Cleveland, Millard Fillmore, Franklin Pierce, Ulysses S. Grant, Calvin Coolidge, and Franklin Roosevelt. He also has royal connections that include King Henry VIII and the current royal family through Princess Diana and Queen Elizabeth II. Matt Damon's 8th great-grandfather is Thomas Damon, the immigrant ancestor who came to America in the 17th century. He died around 1683 in Reading, Massachusetts. There is a belief among some researchers that Thomas's parents are Thomas and Rachel Damon, whose son Thomas was baptized 28 OCT 1627 in Faversham, Kent, England. Evidence is needed to either prove or disprove this claim. Edward Stebbins was the 9th great-grandfather of Matt Damon and he is the brother of Editha Stebbins, wife of Robert Day. Editha (Stebbins) Day was the 6th great-grandmother of President Grover Cleveland. Although it is known that Edward and Editha Stebbins are brother and sister, what is not so certain is their parentage. It has been suggested that Edward Stebbins may have been the son of William Stebbing whose son Edward was baptized at Black Notley, Essex, England, on 24 FEB 1594/5. If evidence can be found to prove William Stebbing is the father of Edward Stebbins, then both Matt Damon's and President Cleveland's ancestries will be affected.